Las Vegas, Nevada – On New Year’s Eve, two world-class athletes made history in Las Vegas, kissing 2008 goodbye and welcoming in 2009 with a bang. Unsatisfied with traditional resolutions, these athletes broke boundaries and propelled themselves in to the history books with amazing feats of skill and calculated risk at Red Bull: New Year. No Limits. At approximately 8:30 p.m. local time (11:30 p.m. 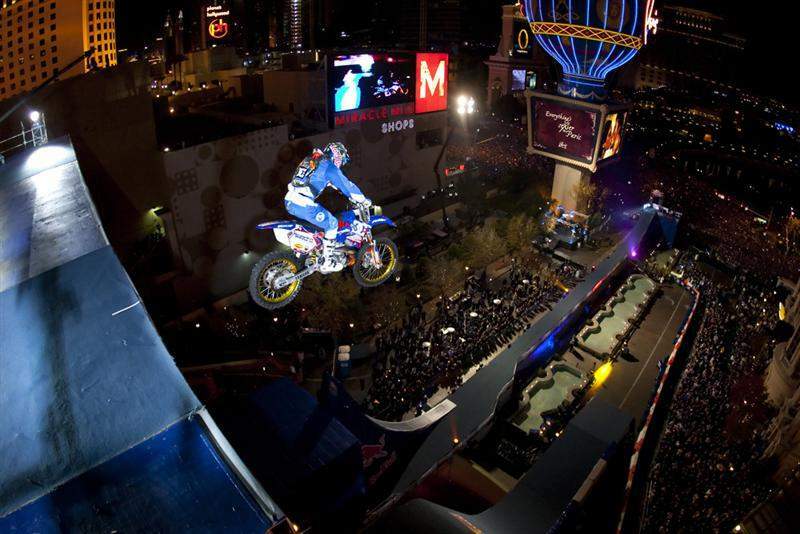 ET), Rhys Millen performed the first-ever backflip in an off-road truck at the Rio All-Suite Hotel & Casino. 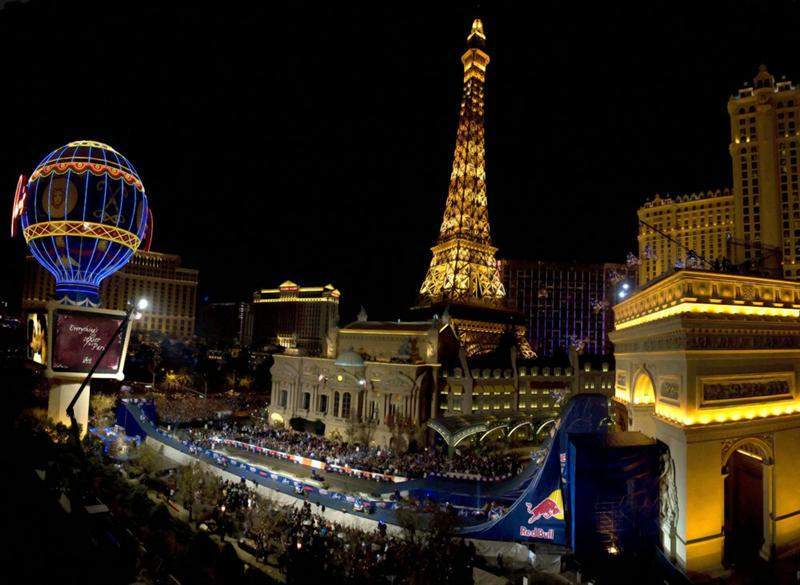 Not to be outdone, Robbie Maddison, who set the world record for a distance motorcycle jump on New Year’s Eve last year, followed up this year with a 10-story-high jump, landing on the top of the replica Arc de Triomphe in front of Paris Las Vegas shortly after 9:00 p.m. local time (midnight ET). Red Bull: New Year. No Limits. was telecast live on ESPN to a worldwide audience. 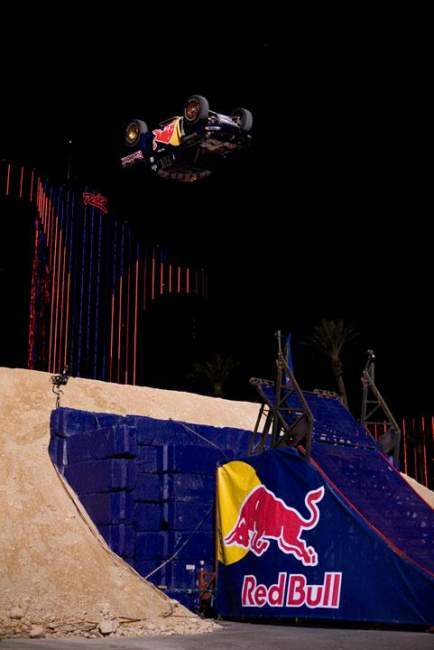 Millen’s backflip in an off-road truck was the realization of a goal set in 2007. During his final practice before the 2007 Red Bull New Year’s Eve event, Millen overshot the landing, resulting in injury, damage to his vehicle and his withdrawal from the event. 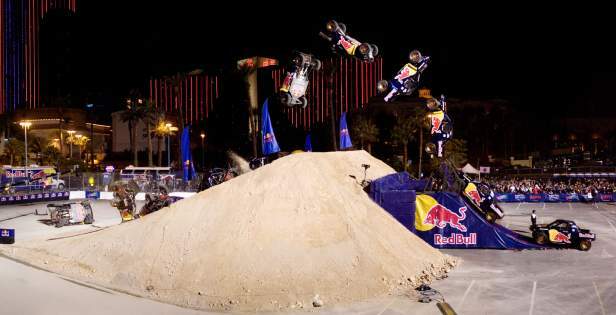 But along his road to recovery, the 36-year-old Kiwi kept the backflip in his mind, and his determination drove him to attempt – and complete – the feat this year. During the flip, Millen’s truck hit a specially-designed ramp at 36 miles per hour and once airborne, travelled a distance of 80 feet at a height of 50 feet, landing heavily on all four wheels before rolling upside down. Millen exited his truck unscathed. Millen has an extensive motorsports background. He was the 2005 Formula Drift champion, 2008 Red Bull Drifting World Championship winner, Pikes Peak International Hill Climb world record holder and has been the lead stunt driver in several commercials and movies, such as Dukes of Hazzard, Fast and Furious: Tokyo Drift and Indiana Jones and the Kingdom of the Crystal Skull. Having broken the Guinness World Record for a motorcycle with a leap of 322 feet, 7.5 inches over the length of a football field during the 2007 Red Bull New Year’s Eve event, Maddison had nowhere to go but up – more than 100 feet up. 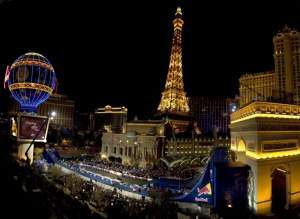 In front of a crowd of more than 300,000 New Year’s Eve revelers chanting his name, the 27-year-old Aussie accelerated to 55 miles per hour and launched his bike 105 feet high, landing on the top of the 96-foot-high and 40-foot-deep replica Arc de Triomphe in front of Paris Las Vegas. After successfully landing on the top, Maddison swung his motorcycle around and dropped a dizzying 60-plus feet to a landing ramp below, the immense force of the impact lacerating his left hand, which was sutured at a local hospital. 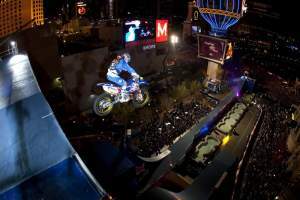 Maddison’s impressive resume, in addition to his record-breaking distance jumps, includes a very successful freestyle motocross career. For additional event information, as well as information on Maddison and Millen, visit www.redbullnewyearnolimits.com.